...and may not until well into January based on the short term forecast,Bill. 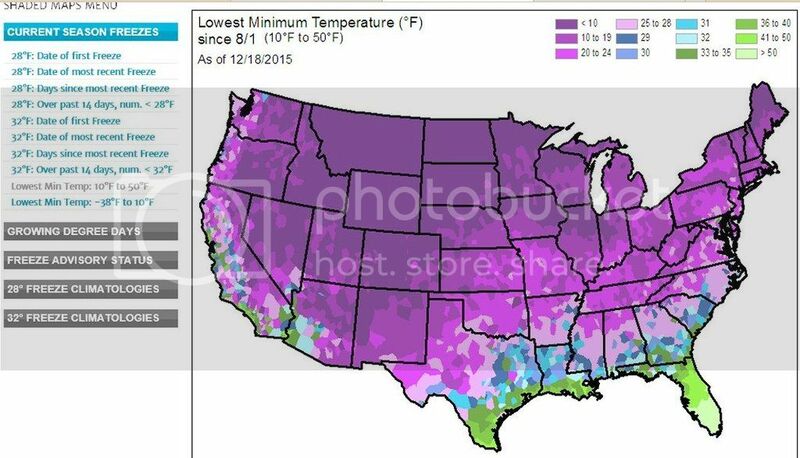 The map below shows the lowest temps on the US mainland this fall and early winter (to December 18th). You can see the areas of 33 F and above (green colors) are along the coastal areas from South Carolina through the Gulf Coast...to the deserts and parts of California. In fairness, keep in mind that some of this is climatological, much of central and south Florida average frost free, as does some parts of CA, coastal south Texas, and southern AZ.